A popular TV show when I was a kid was Mutual of Omaha’s Wild Kingdom. Host Marlin Perkins and his naturalist sidekick Jim Fowler brought nature and wildlife into our living rooms. Starting in 2013, Wild Kingdom premiered a series of webisodes that featured new host Stephanie Arne, a new format and new stories about the world’s wildest places and creatures. In 2017 I had the pleasure of shooting underwater video for their new series titled, The Floating Forests. 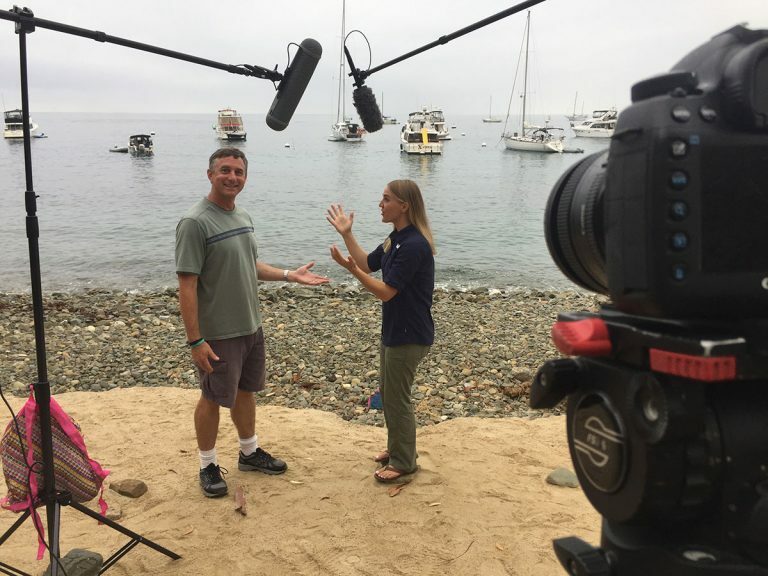 We filmed this new series about kelp forest ecosystems at Catalina and Anacapa Islands. In Life in the Kelp, Dr Jenn Caselle, of the Marine Science Institute at the University of California, looks at the diversity of life in a kelp forest. Check out the underwater video of giant sea bass that I shot with a Canon 5D Mark IV. In The Kelp Forest Ecosystem, Dr. Jenn Caselle explains what kelp is and how it benefits the ocean and our planet. 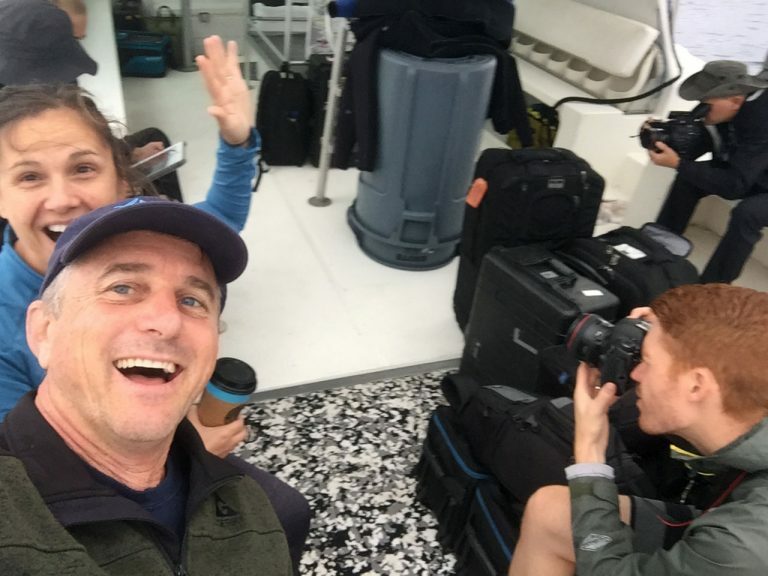 In Sanctuaries in the Sea, Dr. Jenn Caselle explains how she and her team monitor kelp forests and how marine protected areas help keep the ocean healthy. …along with more underwater video of giant sea bass! Wild Kingdom host Stephanie Arne: smart, articulate and fun. 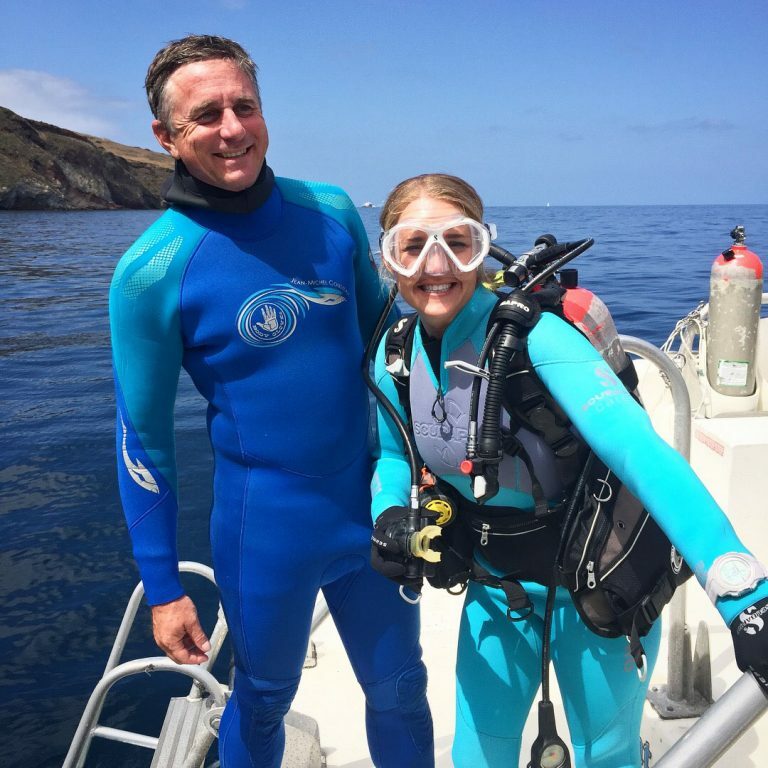 We got along just fine – her in her Scuba pro sponsored powder blue wetsuit and me in my Jean-Michel Cousteau team wetsuit. Good fun at Catalina Island! The Mutual of Omaha’s Wild Kindgom series is produced by Mike and Patty Malone of Malone and Co. located in Nebraska. Mike and Patty and their crew are exceptional at their craft and they were awesome to work with. We had so much fun together filming these episodes. Check out other episodes in The Floating Forest series and many other webisodes of Mutual of Omaha’s Wild Kingdom HERE.